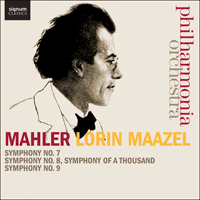 Recorded live in London’s Royal Festival Hall in 2011, this final instalment of Lorin Maazel and the Philharmonia Orchestra’s much-lauded Mahler cycle presents Symphonies 7, 8 & 9. This was the last of the purely instrumental symphonies Mahler composed before returning to the use of choral and solo voices in the massive Eighth Symphony. It remains one of his least known and, perhaps, his least understood. Enigmatic, inscrutable, perplexing—commentators all seem to reach for similar descriptors. Even Mahler’s biographer, Henry-Louis de La Grange, suggests that the Finale to the Seventh was ‘perhaps the most bizarre and disconcerting piece Mahler ever wrote.’ It is hard to identify exactly why the Seventh has developed such a reputation. In other regards, it seems to slot comfortably into Mahler’s oeuvre as the third of the three ‘middle-period’ instrumental symphonies, ‘the post-tragic, ironic, riotous counterpart to the Sixth’ (as Stephen Hefling described it). But, rather like the Fourth, the Seventh Symphony declines to conform to the model of a Mahler symphony that even Mahlerians have come to expect. Outwardly it seems to do similar things, but there is something about its tone, the ways in which it presents itself, that leaves a listener with more questions than answers. In the absence of any obvious programmatic hints, scattered comments about the work as a kind of nocturnal journey, ending in the sunlight of the Finale’s C major, seem to have stuck. The Scherzo has the marking Schattenhaft (shadowy, or ghostly), but the nocturnal suggestion is made most strongly by the two serenades that form the second and fourth movements, each designated by Mahler as Nachtmusik (night music). Alma suggested that her husband was thinking of the Romantic poetry of Eichendorff when he composed the fourth movement, a writer whose work is suffused with nocturnal landscapes evoked through sound rather than imagery. But this intriguing comment suggests a wider frame of reference for the symphony as a whole. As is clear in the Fourth Symphony, Mahler was fascinated by the fairytale and the child’s make-believe vision of the world, finding in naïveté a kind of truth that he often sought to express in his own music. His early attempts at operas were based on fairytale stories (he had no time for realism in opera) and one of his favourite works was Humperdinck’s Hänsel und Gretel, which he conducted many times. His early songs and symphonies were shaped by his settings of the folk poetry of Des Knaben Wunderhorn whose rhymes evoke the world of a child’s picture book. Unsurprisingly, Mahler found himself out of step with the kind of modernism represented by Richard Strauss or younger composers like Alexander Zemlinsky. While his contemporaries set the latest modern poetry, Mahler’s favourite authors were German Romantics from nearly a century earlier—Jean Paul Richter and ETA Hoffmann. Why is this relevant? Because, over and again, Mahler’s Seventh Symphony seems to work like a fairytale and exhibits the same kind of unpredictable twists and turns in its unfolding as are found in the stories of his favourite authors. In the Seventh he seems concerned with the same fantastical landscapes and characters, forever crossing a blurred boundary between the real and the imaginary. This is not to say that Mahler’s symphony is based on any particular story, just that it works like one and evokes a similar atmosphere. Above all, it deploys the central Romantic category of humour, constantly pulling the carpet from under our feet and presenting something one moment, only for it to turn out to be quite another thing in the next. The result is a symphony that is often characterised by interruption and non sequitur. It makes for some of Mahler’s most modernist music, but whose unpredictable logic has its roots in Romantic fiction. None of this is much in evidence at the start of the first movement, which seems to pick up where the Sixth Symphony left off, in funereal mood. Over the sombre rhythmic accompaniment of the orchestra, a tenor horn enters with a strangely angular theme. Even the tone of the instrument sounds strange in this context, imported into the orchestra from the brass band. Its rather alien sonority was wonderfully characterised in Mahler’s comment that it conjured up the ‘roaring of nature’, using a German word for ‘roaring’ that refers to the haunting call of a stag during the rut. Just as he had done with the solo trombone in the opening movement of the Third Symphony, Mahler chose an instrument whose very strangeness would arrest his audience, signalling the idea of something uncanny or wild, entering the familiar musical space from an unknown territory. The slow march of the opening eventually gives way to a much more energetic one in which dark orchestral colours are replaced by brighter sounds. As in the Sixth, the march theme is contrasted with a more lyrical second theme, the two often interrupting each other without obvious preparation. This opposition is itself interrupted by a passage in which the violins of the orchestra deliver a kind of vocal line—its melodic phrases are marked by little pauses, turn figures and obvious ‘breaths’. The march material returns periodically in this movement, unrelenting and insistent, a kind of treadmill that Mahler cannot manage to get off. Various attempts are made to divert it and take the music elsewhere. The most effective is a passage that suspends the forward movement of the march (rather like the pastoral episode in the first movement of the Sixth). Here the music approaches some mysterious threshold; a trumpet sounds a quiet fanfare, anticipating a moment of resolution but one outside of the main timeframe of the piece (motifs built on superimposed fourths give this passage a particularly ‘extraterrestrial’ atmosphere). The threshold does indeed deliver the promised breakthrough, a sudden luminous moment of lyricism, but delivered pianissimo, the glimpse of a vision still distant. Its move towards a firm resolution is cut off by a return of the darkly portentous tone of the opening. In a conventional symphonic first movement, this moment of recapitulation, with its return to the main key and opening theme, is a powerfully affirmative gesture—a point of arrival after the drama of the development. But Mahler inverts this effect and creates its exact opposite: the reconciliation glimpsed in the preceding passage is silenced by the negativity of the return to the opening material. In place of the fullness imaged a moment earlier, Mahler returns us to the emptiness of the opening bars. The drama begins again with the march theme attempting to forge some progress, culminating in the grand, though decidedly forceful gestures of the closing section. The last five bars break through to the major key, but self-consciously so, as if aware of the conventional nature of their happy ending. The first Nachtmusik begins and ends with the sounds of nature; a horn call, sent out across the valley, is answered by a second horn, while chattering woodwind lines evoke a sense of the self-sufficient burbling of nature. Later, the woodwind are marked in the score as ‘like the voices of birds’. As the movement proceeds the sounds of nature are mixed up with the human world; passages of serenade music emerge from this landscape, but mingled with the sound of cowbells. It is one of Mahler’s richest but most delicate patchworks, a coming together of disparate elements that, in the dark, one can never quite identify. It has aspects of operatic scene painting about it, but its closest analogy might be found in one of the fantastic nocturnal landscapes evoked in the novels of Jean Paul. The opening horn calls are Mahler’s way of signalling the different space of such a nocturnal landscape, removed from the quotidian world, as it is in German Romantic poetry—an idyllic space in which the normal rules of the everyday life do not apply, and in which magical events come to pass, just like Shakespeare’s setting for A Midsummer Night’s Dream. Compared to this idyllic space, Mahler’s third movement signals a decidedly urban location. This is one of his most radical Scherzo movements, which begins by gradually piecing together its musical fragments and ends by allowing them once again to fall apart. Among its assemblage of disconnected city sounds are a collection of waltz fragments, in which the melody is cut away from its accompaniment figures and dissolved into ungraspable, scurrying figures. The tone is frequently veiled and the material hard to grasp, but at other times exaggerated and strident as the melodic line of the waltz is stretched out over uncomfortably wide intervals. Mahler foregrounds instruments not normally given melodic prominence—the tuba, the double bass, the contra-bassoon and a solo viola. His orchestration breaks the material down into constantly changing colours and shapes; it comes together, builds up momentum and then collapses, only to start again. This movement is one of the most modern Mahler ever wrote; it shares with Berg’s Reigen movement from his Three pieces for orchestra (1913-15) the sense of an already ghostly picture of Vienna, on the brink of its own collapse. The fourth movement, the second Nachtmusik, frames itself as a serenade in its opening few bars. A deliberately sentimental phrase in the solo violin introduces the little serenade band, a group of wind instruments accompanied by guitar, harp and mandolin whose unpolished character seem to have more in common with Stravinsky’s The Soldier’s Tale (still several years in the future) than the tradition of the Austro-German symphony. While the mandolin looks ahead to the orientalism of Das Lied von der Erde, the guitar anticipates Berg’s use of it for his tavern folk band in Wozzeck. It is perhaps in this movement that the fairytale tone of the Seventh Symphony is most prominent. Mahler uses the familiar to create something that is both nostalgic and disconcerting, but always done with great lightness of touch. It is a world apart both from the grim drama of the Sixth Symphony or the monumentalism of the Eighth. The Rondo-Finale opens in rumbustious fashion, with a flurry of fanfare figures in the timpani and brass. The opening has often been heard as a thinly veiled reference to the overture to Wagner’s opera Die Meistersinger von Nürnberg with which it shares a diatonic C major tonality, a rich contrapuntal texture and a sense of collective festival. But, unlike Wagner’s overture, Mahler’s opening is interrupted and its festivities cut short. To be sure, the interruption is only temporary, but it happens again and again. Indeed, the whole movement is characterised by powerfully energetic passages suddenly sidestepped by non sequiturs. One section ends abruptly as another starts, but always at a tangent to the preceding one. The symphony as a whole is full of framing devices that are subverted by what follows them, throwing undue attention onto the frames themselves rather than the main material. Its Finale in particular draws attention to its own formal divisions and its moments of rupture and hiatus. The result is a sense of tremendous plurality as if, to continue the Wagner reference, many different groups of people are all converging upon the same place. This plurality is only just held together by the rondo returns of the opening fanfare material—it comes seven times in all, exaggerating the sense of an almost arbitrary return of the opening festivity. That suspicion is underlined by the heavy emphasis on the brass. Even a critic well-disposed to Mahler, like Elsa Bienenfeld, thought that the ‘shouting for joy’ in the brass tended to sound ‘coarse and inelegant.’ It is no coincidence that Mahler had used the same rondo form for the Finale of the Fifth Symphony, with which this movement has much in common. Whereas a sonata form has a kind of one-directional, linear logic to it, narrating its musical content like a 19th-century novel, a rondo form, with its unrelated episodes separated by returns of an opening refrain, constructs a far more plural and multi-directional scene. It confers upon this symphony a sense that it is self-propelling, more abstract and autonomous than earlier Mahler works, which project a stronger sense of dramatic plot. An opera conductor for his whole life, Mahler was no stranger to theatrical gesture. When the closing section ushers in an apparently triumphal tolling of bells and bright C major fanfares in the brass, it is hard to tell whether he is being entirely serious. Just as one suspects that this master of illusion has staged a theatrical festival rather than a real one, he seems, by force of sheer willpower, somehow to have produced it as a reality after all. As the horns ring out at the end like pealing bells, it would be a hard-hearted listener who refuses to believe in them. And yet the fairytale mode lingers even here; the grand gestures may suggest joy and affirmation, but the little twist, in the penultimate bar of the whole symphony, suggests you cannot be quite sure. Even within Mahler’s extraordinary output, the Eighth Symphony stands alone. It marks a kind of extreme, not only for Mahler, but for the Romantic symphony in general. Of course, it requires famously large forces: the label ‘Symphony of a Thousand’, invented by a concert agent for the first performance, may seem exaggerated today, but that first performance reputedly included 858 singers and 171 instrumental players. But it is more than a question of size alone. Other Mahler symphonies take longer to perform (the Third, for example), and the combined forces of large orchestra, chorus and solo voices had already been deployed in his Second Symphony. There is, nevertheless, something uniquely monumental about the Eighth; alone among Mahler’s symphonies, it speaks in an utterly affirmative tone, without any trace of irony or self-doubt. The première, conducted by the composer in Munich on 12 September 1910, was the greatest public success of Mahler’s life (just seven months before his untimely death). Thomas Mann was moved to suggest afterwards that Mahler expressed ‘the art of our time in its profoundest and most sacred form,’ and Mahler himself referred to the Eighth Symphony as his ‘most important work’ and ‘greatest achievement.’ But it had not always been so. In the four years between its composition in 1906 and première in 1910, Mahler had effectively been forced to resign as Music Director of the Imperial Court Opera in Vienna and become something of an exile, taking up a post at the Metropolitan Opera in New York in 1907. As both conductor and composer, the acclaim he received had always been mixed with ferocious personal criticism, much of it anti-Semitic in nature. So the triumphant success of the Eighth, Mahler’s monumental ‘gift to the nation’, must have felt like a vindication of his own artistic vision, and a homecoming that had eluded him for 50 years. The Eighth Symphony was largely composed in a mere eight weeks of incandescent creativity, in the summer of 1906, at Mahler’s lakeside retreat on the Wörthersee in the Austrian province of Carinthia (Brahms used to spend his summer holidays further down the lake). He later described the process in terms that anticipate Stravinsky’s account of composing Le sacre du printemps: ‘The whole immediately stood before my eyes,’ Mahler recalled, ‘I had only to write it down, as if it had been dictated to me.’ He would have been painfully aware of the contrast with the previous year, when the precious weeks of his composing summer, an oasis in his hectic schedule as a conductor, slipped away without inspiration, before he belatedly found the opening bars of his Seventh Symphony. Perhaps that memory haunted him as he arrived at the Wörthersee in June 1906 and seized immediately upon the text of an ancient Latin hymn with its energetic summons, ‘Veni, creator spiritus’ (‘Come, creator spirit’). Mahler draws out two opposing ideas from his text: after the opening affirmation of strength, infused with the divine spirit of creative energy, comes a statement of human frailty (‘Infirma nostri corporis’—‘The weakness of our bodies’). The vitality of the opening ‘Veni’ here subsides to a quite different music. Human weakness is evoked by broken exchanges between the two choirs, a halting lament that forms the background to an anxious commentary by the solo violin. This is an ‘all-too-human’ world, mortal and frail, a picture of the world in the absence of the spirit evoked in the first section. It is one that will later be recalled in Part II, but for now its plea for spiritual sustenance, intensified by the soloists following an orchestral interlude, is answered by a great rush of new energy (‘Accende lumen sensibus’—‘bring light to our senses’). Mahler literally launches the music into a new key at this point, but also a new tone, highlighted by the addition of a boys’ choir. This section fulfils the role of the development in a more conventional symphonic movement, and takes on a markedly battle-like character. The dramatic opposition of different sections of the choir and orchestra is Mahler’s response to a line in the text about repelling the enemy. It initiates a vast double fugue that leads the music, without let up, to a grand reprise of the ‘Accende’ music. A recapitulation of the opening ‘Veni’ by the entire chorus restores the tone of the opening and thus rounds out the whole movement as one huge three-part form. There is, however, no return to the music of human frailty; instead, the music is steered towards its conclusion by a final ‘Gloria’, given three times—first by the boys’ choir, then by two soprano soloists and finally by the whole chorus—but then swept up in the surging torrent of sound with which the movement ends. The opening of Part II could not be more different. After the electrifying sonority at the close of Part I, we find ourselves in the utter emptiness of a desert landscape. The only sense of motion comes from the slow, circling tread of the cellos and the basses, and the distant calls of solitary woodwind instruments, s if heard across a vast space. But this lifelessness becomes the foil for an intense longing, a yearning for spiritual sustenance. Heard in the cellos and horn, this impassioned protest sparks off a quite different kind of musical voice, urgent and angular, raging against the emptiness of this limbo state of the soul. Mahler first sets this scene in the orchestra alone, and then revisits it with the addition of voices. The chorus assumes the role of a group of anchorites, living among the rocks in a wild landscape of forests and cliffs. The contrasting passionate voice is taken up by two soloists, the Pater Ecstaticus (baritone) and the Pater Profundus (bass), who sense in the landscape the immanence of divine presence (Mahler chose not to set Goethe’s third anchorite, the Pater Seraphicus). The intensity of their lyrical yearning is expressed by a stretching of the vocal line across wide intervals—an acoustic symbol of the breaking of mortality as a prelude to spiritual transformation. The tortured, Wagnerian chromaticism of the two solo voices is wonderfully dispelled by the chorus of angels that follows, celebrating the salvation of Faust’s soul (‘Gerettet ist’). Mahler evokes the heavenly realm through a simplified and deliberately naïve music—the simplicity of folk music that he had explored earlier in his career in his setting of texts from Des Knaben Wunderhorn. A childlike aspect is underlined by the return of the boys’ choir (as a ‘Chorus of Blessed Boys’) and the entry of ‘The Younger Angels.’ But these celestial voices are temporarily interrupted by a return of the music, from Part I, denoting human weakness (complete with its distinctive solo violin commentary). It serves here as a reminder of the twofold nature of man—both earthly and divine—which, as a chorus of ‘More Perfect Angels’ tells us, only eternal love can separate. The soul of the deceased Faust, now transformed into the character of Doctor Marianus (sung by the tenor soloist), appears in the highest of the anchorites’ rocky cells. A mere onlooker at first, watching the scene unfold before him, he then comes to the fore to herald the vision of the Mater Gloriosa, in flight across the sky. This moment is marked by an astonishing change of musical tone, from the lyrical rapture of Doctor Marianus to an otherworldly simplicity to represent the vision of the Mater Gloriosa. A shift from E flat to E major (Mahler’s ‘heavenly’ key) is combined with a sudden thinning of the orchestral texture to leave only a hymn-like melody in the violins, accompanied by a harmonium and harp. The forward push of desire, and its yearning to overcome absence, gives way to the stillness of fulfilled presence. In the gradual ascent traced out by both text and music, this luminous new sound evokes the achieved space of some high, boundless plateau. As a musician, Mahler realises that sense of arrival, first and foremost, through sound. Taken as a whole, the musical journey of Part II traces an ascent that matches Goethe’s final scene, from the earthly realms of a rugged mountainous landscape to the ethereal space of heaven. In a quite literal way, it achieves this by moving from the rougher sonority of the bass and baritone soloists to the purer tones of the upper register—the voices of boys and women, and delicate orchestral sonorities that at times anticipate the refined orientalism of Mahler’s next work, Das Lied von der Erde. Well before the Chorus Mysticus delivers Goethe’s iconic final line, ‘womanhood everlasting draws us on high’, we have already been borne aloft musically by successive waves of sound characterised as distinctly feminine. But Mahler creates this transformation by more than simply privileging female voices, upper registers or delicate orchestration. The palpable effect of his evocation of everlasting womanhood also has to do with the way in which he draws us into a universe of sound. From the moment that the Mater Gloriosa appears, as a wordless vision, the listener is wrapped in a series of sonorous layers. The music no longer moves forward, but expands in successive waves. Whereas Part I enacts its action-packed drama through an often masculine and sometimes militaristic tone, Part II concludes in a far more contemplative, spatial and feminine tone. In its soaring immensity and acoustic resonance, Part I might be heard to evoke the vaulted architecture of a Gothic cathedral; Part II seeks the release experienced in the space of high mountains, where the edge of the sky blurs with the deep blue of space. In 1907, after more than a decade as Director of the Vienna Court Opera, Mahler accepted a post at the Metropolitan Opera in New York. For the remaining four years of his life, he spent six months in New York (October to March) and six months in Austria (April to September), where he continued to spend the summer in his beloved mountain landscapes. Das Lied von der Erde, the Eighth, Ninth and unfinished Tenth symphonies were all written in a small forest hut in the Dolomites (then part of Austria, now in Italy). The tension Mahler endured all his life, between a hectic conducting season in the city and the solitude of his summer composing retreats, must have felt even more pronounced in these last years. Returning to the idyllic peace of the Tyrol, after long transatlantic crossings and the foreignness of his American life (he spoke very little English), must have been marked by an overwhelming sense of homecoming. Such a feeling is evident in both Das Lied von der Erde and the Ninth Symphony. Mahler’s late music is often associated with the idea of farewell, specifically a farewell to life itself (he was diagnosed with a fatal heart disease in 1907). This association was first elaborated after the posthumous première of the Ninth Symphony on 26 June 1912, conducted in Vienna by Bruno Walter. The idea was repeated over and again, and continues today as a dominant reading of the symphony. ‘If you want to learn to weep,’ wrote one critic after the première, ‘you should listen to the first movement of the Ninth, the great, magnificent song of ultimate farewell.’ But one should be cautious about reading the Ninth Symphony too literally. Mahler’s biographer, Henry-Louis de La Grange, underlines that the effects of Mahler’s heart disease have often been exaggerated. When he wrote the Ninth, at the age of 49, he was in good health, and at the end of that summer returned not only to his post at the Metropolitan Opera, but to conduct his first season with the New York Philharmonic (some 46 concerts). The following year he drafted the majority of his Tenth Symphony and had the greatest success of his composing career with the triumphal première of the Eighth Symphony in Munich, before travelling back to New York for his fourth season there. Hardly, perhaps, the actions of a man on his deathbed. The Ninth Symphony opens tentatively and in a curiously fragmentary way: a single, faltering rhythm shared between the cello and horn, a low harp figure like the tolling of bells, a rustling in the violas and a single phrase of a distant horn call. Only as these broken elements coalesce does the music gain a downbeat and the Andante proper begin. The song-like theme in the violins seems to generate itself little by little, from a single sighing fall to an increasingly expansive melody. Its proximity to the Leb’wohl (Farewell) theme of Beethoven’s 'Les Adieux' sonata, and Mahler’s scribbled annotations on the score, have always marked out this D major ‘song’ as one of poignant valediction. Others have suggested that the theme closely resembles a melody from Johann Strauss’s waltz suite Freut Euch des Lebens (Enjoy life! ), which makes sense given its tinge of sentimentality and Mahler’s inclination to irony even at moments of greatest sincerity. There is also a telling overlap with the closing pages of Das Lied von der Erde. Mahler’s much-discussed use of pentatonicism in that earlier work, to achieve its uniquely weightless ending, is also present at the start of the Ninth. As the violin melody falls (F sharp to E) so the counterpoint in the horn rises (A to B). The symmetry of the movement and the resulting harmonic richness, suggest a simple motion that might rock gently back and forth for ever. But this is not the end of a work, it is the beginning. 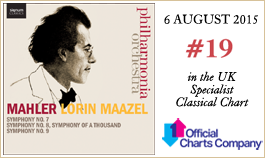 Mahler uses his poignantly lyrical Andante in D major as one element in a polarised opposition. The negative pole is a more impassioned and chromatic version in D minor. With each successive alternation between the two, the distance between these worlds seems to increase, as the music plunges from heroic striving, on the brink of some rapturous breakthrough, to moments of complete collapse into a shadowy, empty landscape (Mahler’s marking is Schattenhaft—shadowy). Berg’s reading, that the whole first movement ‘is based on a premonition of death’, captures the proximity in this music between the terror of an implacable force and the sense of cherishing every last detail of the earth. Faced with no hope of reconciling such an opposition, the end of the movement is shaped by quiet withdrawal and dream-like reminiscence. Mahler marks the final page of the score ‘lingering’; in the sketches, he wrote simply ‘Leb’wohl!’ (Farewell!). The second movement alternates four contrasting Austrian dances—two Ländler (of the countryside) and two waltzes (of the city). The first Ländler is marked ‘somewhat clumsy and very crude’, its raw quality underlined by the bad behaviour of the horns and the instruction to the violinists to play ‘like fiddlers’. This is a country dance in heavy, muddy boots, done with great affection even as it gently falls apart into garrulous repetitions. The rustic cartoon is interrupted by a mad waltz that spirals out of control, changing key with a sense of drunken abandon. A second waltz, given in the low brass, sounds as though a military band has invaded the orchestra, before a second, slower Ländler wistfully recollects a quieter, more rural life. Mahler’s modernity here lies not so much in his materials (bewilderingly familiar to his first listeners) but in the way that he foregrounds the lack of fit between them as the music lurches from the frivolous to the grotesque, the sentimental to the modern. At the end of the movement, he allows his orchestra to fall apart like a machine shedding its parts one by one. The music breaks into fragments, scattered around the orchestra, until the whole thing simply runs out of steam. In the third movement, the sense of distortion and exaggeration is greatly magnified. Mahler’s Rondo-Burleske presents a highly energetic and contrapuntal music, but one that struggles to contain its plural voices, all tugging in different directions at once. Just as it seems ready to implode under its own weight, this unrelentingly strict style gives way to a lightweight music that sounds like operetta (some critics heard echoes of Lehár’s The Merry Widow). The recurrent interruption of one element by the other is eventually broken by an astonishingly self-conscious act of authorial intrusion. Mahler ‘rips up’ the music heard thus far, like a film-director suddenly intercutting a completely different scene. A series of glissandi in the harp introduces a disjointed set of musical voices—some of them grotesque and distorted (the E flat clarinet) and others earnestly expressive (the solo trumpet). This whole passage, suspended out of normal symphonic time, functions like a set of dream visions of what might yet be, before we are thrown back into the movement’s opening material, gathering its ferocious force all the way to the end. What are we to make of the tone of this movement, signalled by Mahler’s pointed title of Rondo-Burleske? The musicologist Stephen Hefling calls it ‘virtuosically sarcastic’ and there are plenty of echoes of Berlioz’s technique, in the Finale of the Symphonie fantastique, of presenting grotesquely distorted and caricatured versions of material earlier given as noble and beautiful. The studied contrapuntal texture of the movement seems to suggest Mahler’s fascination and admiration, in the last decade of his life, for the music of Bach, but here this musical technique for harmonious order seems to spin off in all directions and produce the opposite result. The same is true of Mahler’s use of the orchestra, which throughout this symphony breaks up musical lines into smaller, dissociated particles, just like contemporary painters were doing with colour at the same time. For the concert-goers of Vienna or Munich or Paris, the orchestra represented one of the highest achievements of European culture, a model of perfect integration and coherence, yet Mahler seems to set this well-oiled machine at odds with itself, breaking its voice from within. It is perhaps no wonder that critics reacted with such angry incomprehension. Though Mahler had ended a symphony with a hymn-like Adagio before, in the Third Symphony, its affirmative conclusion is completely at odds with the extended withdrawal of the Adagio that concludes the Ninth. In the closing years of the 19th century there was a deliberate attempt among Austro-German composers to recover the noble solemnity associated with some of Beethoven’s Adagio movements and the Adagio of Mahler’s Ninth has sometimes been compared to that of Beethoven’s last String Quartet (Op 135). For us, Bruckner’s Ninth Symphony may provide the most obvious model, though when it was premièred posthumously in Vienna in 1903, his Te Deum was inserted in place of the Finale that Bruckner failed to complete before his death in 1896. Mahler’s Adagio ending, like that to Tchaikovsky’s 'Pathétique' Symphony (of 1893), was fully intended to be the close of the work. Once again, progress is defined by the alternation of two different types of music—the richly scored, passionate and painfully beautiful opening, and a passage of bare, two-part music, shocking for its apparent emptiness and marked to be played ‘without emotion’. But the hymn-like tread of the opening music is constantly misdirected from its goal by a spiralling chord sequence first heard in the first waltz of the Scherzo. The arrival and closure for which this music seems to strive is constantly withheld. Yet in spite of everything—the emptiness of the silences, the absence of arrival, the dissolution of the voice—the music continues. If the Ninth is indeed a farewell, it does not ‘go gentle into that good night’. Nobody who feels this music intensely would be so crass as to attempt to say ‘what it is’ that Mahler’s music sings about. What lingers long after the resonance of the last fragile notes have died away into silence, is that he did—that such a passionate singing was voiced. As all three preceding movements have done, the Finale also ends by means of a gradual process of fragmentation, but whereas the middle movements break down or fall apart, the Finale gently dissolves, its constituent lines, no longer held together, evaporate one by one. The final Adagissimo must be the longest last page in music history, as the remaining fragments of melodic lines, receding into the distance, are gradually reclaimed by an incoming tide of silence. A century after his death, Mahler’s music resonates more powerfully than ever. Its unique mix of passionate intensity and terrifying self-doubt seems to speak directly to our age. One moment visionary, the next despairing, this is music that sweeps us up in its powerful current and draws us along in its drama. We feel its moments of ecstatic rapture and catastrophic loss as if they were our own. This is not music for detached contemplation: it matters to us, urgently and directly. Its musical language may be Romantic, but what makes Mahler’s music so distinctively modern is its unflinching honesty—its embrace of the contradictions of life and of art. Few composers wrote music of such searing lyrical intensity, nor music that is often ironic to the point of parody. But it took a long time for this unique tone to be understood; in his own time, critics heard Mahler’s ability to see the world from several perspectives as a sign of insincerity. Today, we tend to read it as quite the opposite. Mahler’s earlier symphonies frequently draw on the world of his Wunderhorn songs—settings of simple folk poems about birds and animals, saints and sinners, soldiers and their lovers. But this apparently naive, even childlike tone is found alongside vast musical canvasses that depict the end of the world. In quieter, more intimate movements, Mahler seems to speak intimately and directly to the listener, but the big outer movements are addressed to the entire world. At its most sentimental, Mahler’s music echoes the fairytales of children’s picture books, yet in the next moment it marches with gritted teeth and unleashes terrifying violence. All this makes for great symphonic dramas, often lasting more than an hour, which imply a vivid sense of storytelling without ever being confined to a specific programme (as a young man, Mahler adopted the idea of programmes from the tone poems of Richard Strauss, but soon abandoned them). This is a composer who insisted that the symphony should ‘include the whole world’—hence its bewildering mix of different characters, and the sense that, for him, it worked rather like the great novels of the 19th century, such as those by Dostoyevsky or Balzac. We should remember that Mahler was a man of the theatre who, for the 30 years of his professional life, spent most of his time and energy conducting in the opera house. He knew how to create an effect, to stage a scene and to pace a drama. But, like anyone who has worked in the theatre, he had an acute sense that all art is ultimately artifice and make-believe. His favourite writers were those whose works underline their own fictionality which is why, after the dust of the drama has settled, there is a quality of Mahler’s music that recalls the enchanted forest of Shakespeare’s A Midsummer Night’s Dream. Perhaps it is this many-sided character to the music that feeds our fascination with Mahler himself. Of course, this was fuelled by the composer. Mahler subscribed fully to the Romantic idea that art is made from the life of the artist and, in comments to friends, letters, and annotations on his scores, he encouraged listening to his music as a kind of autobiography, as Berlioz had before him. But like all great art, Mahler’s music far exceeds the life that made it, just as it far exceeds his own age. His symphonies look back to those of Beethoven and Schubert, but at the same time forwards to the music of Shostakovich and Britten. In his later works he was increasingly drawn to the music of Bach, at the same time that his own music was revered by the young Schoenberg and his pupils. This is music that crosses historical boundaries—as contemporary and vital now as it was a hundred years ago.